April 15th: Collector's Edge Comics EAST opens with fledgling Edgeguy Manager Diane Eells in the captain's chair. This is actually the second East side location, the first having closed in February of 1995. April 27th: Reserve Edgguy Chris Radomski is reactivated, working new comics day at South. Originally appearing in 1992, he only collected Ghost Rider and Hellraiser. He was deemed "The Scary Guy" because of his long hair, tattoos and because he only collected Ghost Rider and Hellraiser. He is a little less scary now, but not by much. May 6th: The monthly Edgeguy meeting is abruptly interrupted by a multi car accident in front of South. Being quick thinking, all the Edgeguys on site ran into the street, called 911, and recorded the license plate number of a fleeing car. "Good thing we had fast reflexes", Steve thought. Later, the Edgeguys compared and somewhat disagreed on what actually happened, but all agreed Jo was crazy and the Batmobile was no where to be seen. May 12th: The softer side of the superhero scene... East is featured in MKE Magazine. July: The South soda cooler gets a slick upgrade, a new custom insert. September 10th: Kurtis Lyman Wood weds his longtime love Corrine Ann Ciula. Many Edgeguys, past and present, attend. Rumor has it a few Edgeguy villains attended incognito, hence the 2 covers for the invites, one showcasing the Edgeguys and one depicting the Edgeguy villains. October 1st: Will Hunt steps into the Edgeguy reserves, West changes to Winter hours. November 10th: Collector's Edge Comics is VOTED BEST COMIC BOOK SHOP by the Shepherd Express Best of Milwaukee 2005 reader poll (AGAIN!). November 11th: The Edge Office goes broadband. January 8th: 2006 New Year Sale (SOUTH). January 14th: 2006 New Year Sale (WEST & NORTH). January 15th: 2006 New Year Sale (EAST). March: North gets a new back door. Early April: Severe storms hit West Allis, ripping (and nearly destroying) the West location awning… if it wasn’t for the fearless crew (John and duct tape), the West location might have been lost. Late April: East Customer Matt Chicorel enters the Edgeguy Academy hoping someday to be an Edgeguy. After intensive training at South, he interns under the watchful, but harsh, eye of Diane. May 7th: Sadly the prettiest Edeguy thus far departs East. Having trained the new manager of East, she had to move on, but promises to assist us whenever we call. But since most Edguys are scared to call up girls, she will have to stop in on her own once and a while. May 9th : Matt Chicorel assumes the captain's chair at East. Is he ready? Steve merely shrugs and says "snuh". August: South gets a much needed new roof, this one repels water! Early September: South gets a much needed new security door, this one repels bad guys. September 17th: John Steib breaks his wrist while attempting to file comics faster. November 13th: South shuts down for 2 days and gets a new floor (no not a second story; the floor is replaced). Mid November: Neal Bohl (longtime West customer) and Kerry Birmingham (longtime South customer) are recruited into the Edgeguys to assist at South. Originally they were going to fight it out in our two-men-enter-one-man-leaves-Thunderdome; but Steve decided he could use them both. November 19th: West returns on Sundays, opening Noon – 4 p.m.
November 22nd: South hours expand, now open at 3 p.m. on Wednesdays and Thursdays. December 5th: Collector's Edge Comics is VOTED BEST COMIC BOOK SHOP by the Shepherd Express Best of Milwaukee 2006 reader poll (4th time in a row!). December 13th: Collector's Edge Comics introduces its own brand of comic storage long boxes. Designed by Steve, these boxes are custom made for Collector's Edge Comics. They are thicker, better made, slightly longer, and much more durable. December 20th: South gets slick new awning, now customers are shielded from the elements as they wait to get into the store. January 7th: 2007 New Year Sale (SOUTH). January 8th: Keith officially transfers basement duty to new guy Kerry, continues to work in the office. January 13th: 2007 New Year Sale (WEST & NORTH). January 14th: 2007 New Year Sale (EAST). February 1st: South front ceiling gets a facelift. June 1st: Jasmine Schmidt starts training in the office, attempting to master the vast system that controls the edge network. Mid June: Kerry begins training at North. August 18th: John works last regular day at West (see September 9th). Kurt leaves North, heads West to start a new adventure (see August 21st). August 21st: Kerry becomes manager of North (see August 18th). Kurt has taught him everything he knows, well, at least everything he wants Kerry to know. August 22nd: Kurt becomes manager of West (see August 18th). John asks him to wear a name tag that reads "John" on it for a few weeks. He declines. Countdown: The Hunt For John Steib? September 9th: John returns to West on Sundays after a brief (planned) hiatus. We hope his creative team gets back on track and he never goes on hiatus again! (see August 18th). October 9th: Neal Bohl moves on to other things and we wish him luck in future endeavors. 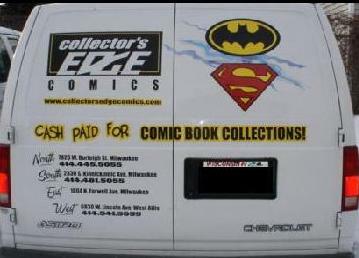 October 11th: Collector's Edge Comics is voted best of comic book shops on the WISN A-LIST. Mid October: Neal Long starts training at South, a package customer from our EAST location, he inherits the "Neal" mantle. November 9th: Greg Rucka, Gregg Hurwitz, and Brian Azzarello (a last minute addition) visit South for an in-store signing and get-together. See photos. December 2nd: East location switches to new winter hours. Closing on Sundays, open normal hours rest of the week. January 6th: 2008 New Year Sale (SOUTH). January 12th: 2008 New Year Sale (WEST, NORTH & EAST). January 17th: Jorge Garcia a.k.a. Hugo ‘Hurley’ Reyes from the hit show LOST was found at Collector’s Edge South. He stopped by to pick up a trade and have a look around. Late March: Collector's Edge Comics becomes a card carrying member of the CBLDF. April 8th: North location back room gets much needed remodeling. April 13th: North. Two kids on bikes collide and smash the storefront window. The EDGEGUY rapid response team rapidly responded and no harm, other than a smashed window, was done. Kerry repeatedly assured his customers he was open. Special thanks to the passerby who alerted our security company. May 1st: Jeff Wojcik starts at Sundays at East, working the new Sunday hours there. See May 4th. May 2nd: Jo Schmidt promoted to South Manager. We always know he was a closet manager... he is finally out of the closet. May 4th: East location switches to summer hours, open on Sundays Noon to 4 p.m.
June 8th: East location switches to NEW summer hours, open on Sundays Noon to 5 p.m.
August 9th: The Milwaukee Journal article, "Comic frenzy wasn't funny during 1950s" quotes East Manager Matt. August 17th: The Milwaukee Journal article, "Nicolet grad animating comic books in a new way" quotes West Manager Kurt. October 1st: Having graduated from the Edgeguy academy, Eric Aho joins the Edge at South. October 7th: Collectors's Edge Comics wins the WISN A-List 2008 Best Comics category. October 18th: Steve and Collectors's Edge Comics are the featured comic book experts at the PBS / MPTV appraisal fair. November 9th: East location switches to new winter hours. Closing on Sundays, open normal hours rest of the week. November 10th: Collector's Edge Comics is VOTED BEST COMIC BOOK SHOP 2008 by the Shepherd Express Best of Milwaukee 2008 reader poll. December 12th: East location. Matt fights off an armed robber, escaping with minor injuries. December 26th: Hannah Lynn Schmidt is born at 6:58 am. We wish Jasmine and her family well, and await her return. January 4th: 2009 New Year Sale (SOUTH). January 10th: 2009 New Year Sale (WEST, NORTH & EAST). January 11th: Matt Chicorel decides to move on from the Edge, we wish him well. Eric Aho takes over as Collector's Edge East Manager. February 1st: Lorelei Patricia Wood is born at 11:56 p.m. Mother Cori did a great job; Kurt stood around and did nothing. Well, he read some comics. March 10th: Jo is featured in the LA Times Comic Book Store Clerks of America, No. 7. April 1st: Rob Maass starts Edgeguy training at South. Jo has high hopes for him and his dog named Scooby-Doo. May 3rd: East location switches to summer hours, open on Sundays Noon to 5 p.m.
August 26th: South falls victim to the string of window smashing in the area, having a hole smashed in one of the main front windows. Steve declares that window was dirty anyway. 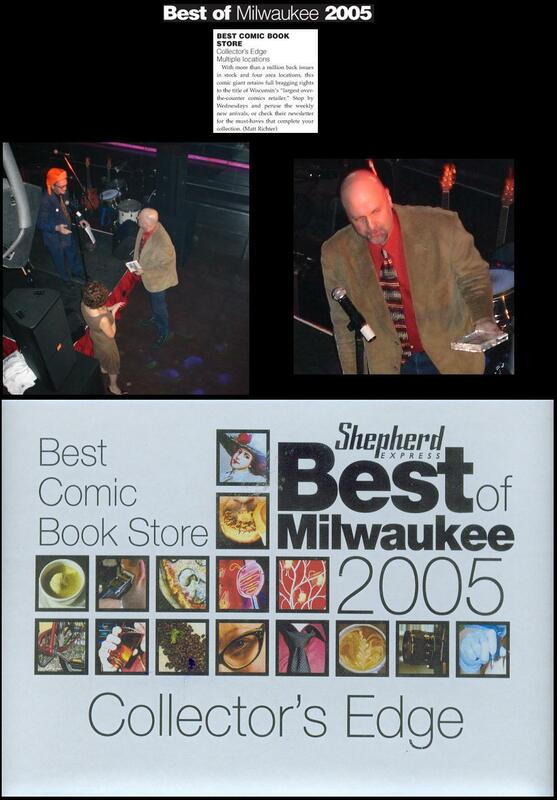 October 5th: Collectors's Edge Comics wins the WISN A-List 2009 Best Comics category. October 25th: East location switches to new winter hours. Closing on Sundays, open normal hours rest of the week. November 9th: Collector's Edge Comics is VOTED BEST COMIC BOOK STORE 2009 by the Shepherd Express Best of Milwaukee 2009 reader poll. December 30th: No shipment "skip week" actually has "December 30th" only titles. January 3rd: 2010 New Year Sale (SOUTH). January 23rd: 2010 "Edge Crawl" EAST New Year Sale. January 30th: 2010 "Edge Crawl" WEST New Year Sale. February 3rd: Collector’s Edge Comics proudly sponsors Seth Grunlode’s SETH IS LOST segment on the Bob & Brian show (102.9 The Hog), heard Wednesday morning every week during the final season… WE are not lost. Visit www.sethislost.com. February 6th: 2010 "Edge Crawl" NORTH New Year Sale. March 28th: North gets a facelift, new walls, expanded space. May 1st: Free Comic Book Day 2010. All Trades 20% off sale! May 2nd: East location switches to summer hours, open on Sundays Noon to 5 p.m.
May 22nd: Seth Grunlode, the HOG102.9 LOST tv show expert host a LOST Nerd roundtable discussion at South. Mid June: Jo is asked to audtion for COMIC CON EPISODE FOUR: A FAN'S HOPE, a documentary of comc geeks and the journey to Comic Con in San Diego. Early July: Steve takes his fist vacation in 3 years. Kerry takes heat when the air conditioning goes on the fritz at North, but otherwise the Edge survived. Early September: South location back service door finally gets an awning. October 10th: East location switches to new winter hours. Closing on Sundays, open normal hours rest of the week. Mid October: East location moves 3 blocks down the road. October 19th: Collector's Edge Comics is VOTED BEST COMIC BOOK STORE 2010 by the Shepherd Express Best of Milwaukee 2010 reader poll. November 11th: Veterans Day Sale! Veterans get 20% off any purchase at any Collector's Edge Comics location. January 9th: 2011 New Year Sale (SOUTH). February 5th: 2011 "Edge Crawl" NORTH New Year Sale. February 19th: 201 "Edge Crawl" WEST New Year Sale. March 5th: 2010 "Edge Crawl" EAST New Year Sale. March 16th: Jamey Scerpella, South package customer, starts training to work South counter. March 29th: Neal Long departs the Edge, entering the Edgeguy reserves. April 2nd: Jo Schmidt steps down as South manager to pursue other opportunities, but stays on to help train for the transition. April 9th: Jo Schmidt enters the Edgeguy reserves… and to finally answer the question: Yes, he was. May 1st: East location switches to summer hours, open on Sundays Noon to 5 p.m.
May 2nd: All locations switch to restructured hours to better serve the needs of customers on New Comics Day Wednesday. Most locations are now open more hours per week. May 7th: Free Comic Book Day 2011. All Trades 20% off sale! and more! Jill Thompson appearances at SOUTH location, 1 to 4 PM, for book signing & autographs. Early August: Rea Laskowski starts Edgeguy training... previously a package customer who always wanted to work here, she finally gets her wish! August 2nd: Zach Dobrzynski starts training under Kurt's expert tutelage at West. Although he insists on getting NO “special treatment” he often reminds Kurt that he IS the owner’s son while requesting his 5th break of the day. August 20th: Kerry Birmingham, esteemed North location manager, has decided to move on to other opportunities and we wish him well. We suspect he might fill in a shift from time to time. Kurt Wood, West location manager and former North location manager has been promoted to “Supervising Manager” and will manage both the West and North locations. August 31st, 12:01 a.m.: The new DC Universe starts, promising 52 #1s that reset the entire DC Universe. Flashpoint #5 (end of the old DCU) and Justice League #1 (start of the DCnU) are the only 2 DC Universe issues to ship this week, and they go on sale at 12:01 am. October 15th: Steve is the Comic Book appraiser at the Milwaukee Public Television Appraisal Fair. October 17th: East location switches to new winter hours. Closing on Sundays, open normal hours rest of the week. October 24th: East experiences a minor flood due to burst pipe. New comic day was business as usual. November 7th: Collector's Edge Comics is VOTED BEST COMIC BOOK STORE 2011 by the Shepherd Express Best of Milwaukee 2011 reader poll. January 4th: West now open at NOON. January 8th: 2012 New Year Sale (SOUTH). February 4th: 2012 "Edge Crawl" NORTH New Year Sale. February 18th: 2012 "Edge Crawl" EAST New Year Sale. March 3th: 2012 "Edge Crawl" WEST New Year Sale. May 5th: Free Comic Book Day 2012. May 6th: East location switches to summer hours, open on Sundays Noon to 5 p.m.
August 1st: Rea "Rogue" Laskowski departs the Edgeguys and CEC... she will be missed. October 22nd: East location switches to winter hours. Closing on Sundays, open normal hours rest of the week. October 31st: Hey KIDS! Trick-or-Treat at Collector’s Edge Comics! Treat-or-Treat at any Collector’s Edge Comics location. Must be in costume to get a treat!! November 1st: Zara A. starts training at South. November 15th: Collector's Edge Comics is VOTED BEST COMIC BOOK STORE 2012 by the Shepherd Express Best of Milwaukee 2012 reader poll. December: After intense basement training Mike Durante starts. January 6th: 2013 New Year Sale (SOUTH). February: Lauren Berger becomes an Edgeguy, training at various locations. February 2nd: 2013 "Edge Crawl" WEST New Year Sale. February 9th: West is robbed in the middle of the day. The clerk on duty recognizes the robber from working at the South location the day before, the robber had shopped at South! Using video surveillance a picture is provided to the police who promptly locate and apprehend the robber. Justice is served. February 16th: 2013 "Edge Crawl" EAST New Year Sale. March 2nd: 2013 "Edge Crawl" NORTH New Year Sale. May 4th: Free Comic Book Day 2013. May 5th: East location switches to summer hours, open on Sundays Noon to 5 p.m.
July 7th: Jasmine departs the CEC operations team. July 8th: Lauren joins CEC operations team, doing double duty as counter clerk and operations assistant. October 9th:Walking Dead #115 MIDNIGHT RELEASE EVENT 12:01 a.m. “All Out War” breaks out on Wednesday, 10/09/2013 with the release of The Walking Dead #115. Celebrate 10 years of Robert Kirkman and Charlie Adlard's epic comic book series at the Collector’s Edge Comics Walking Dead midnight release. At 12:01 a.m. on Wednesday, 10/09/2013, Collector’s Edge Comics WEST will open for 2 hours to sell Walking Dead #115. We will have Walking Dead trades, back issues, variants, postcards, and other Walking Dead items in stock. October 12th: Steve and Collectors's Edge Comics are the featured comic book experts at the PBS / MPTV appraisal fair. October 13th: East location switches to winter hours. Closing on Sundays, open normal hours rest of the week. October 26th: (Until October 31st) Hey KIDS! Trick-or-Treat at Collector’s Edge Comics! Treat-or-Treat at any Collector’s Edge Comics location. Must be in costume to get a treat!! November 13th: Collector's Edge Comics is VOTED BEST COMIC BOOK STORE 2013 by the Shepherd Express Best of Milwaukee 2013 reader poll. January 5th: 2014 New Year Sale (SOUTH). February 1st : 2014 "Edge Crawl" EAST New Year Sale. February 15th: 2014 "Edge Crawl" WEST New Year Sale. March 1st: 2014 "Edge Crawl" NORTH New Year Sale. May 3rd: Free Comic Book Day 2014. May 4th: East location switches to summer hours, open on Sundays Noon to 5 p.m.
May 24th: Ladies' Night at Collector's Edge Comics South. August 23rd: Ladies' Night at Collector's Edge Comics South. August 24th: Seasonal Edgeguy Jeff Wojcik departs the Edge. He may fill in now and then. October 6th; East location switches to winter hours. Closing on Sundays, open normal hours rest of the week. October 11th: Steve and Collectors's Edge Comics are the featured comic book experts at the PBS / MPTV appraisal fair. October 24: Fantasticon! The Edge attends Fantasticon. October 27th: (Until November 1st) Hey KIDS! Trick-or-Treat at Collector's Edge Comics! Treat-or-Treat at any Collector's Edge Comics location.. Any child 13 and under wearing a costume will receive a free trick-or-treat item at any of our FOUR locations during normal business hours. October 31st: Kurt Wood departs the Edge, he may return for a shift or two in the future.